A coconut and cattle plantation that's a testament to a former era with trails for horseback riding. Good Hope Plantation in Falmouth has been lovingly restored as a fabulous estate which has its history recorded from the 18th Century, absolute gracious surroundings with today's contemporary comfort and conveniences. As the year 2000 unfolded, an old cut stone building was restored into a spectacular 3 bedroom villa. Sitting moments away from the rivers swimming hole, River Cottage is ideal for a small family gathering or for a small group of friends, or for retreat participants. Sitting high in the lush secluded landscape of Cockpit Country stands an Eighteenth Century Great House named Good Hope. On 2,000 acres 600' above sea level, Good Hope is framed by dramatic bluegray mountains and renowned for its exquisite gardens and country trails. Its valley is fertile with papaya, oranges, ackee, breadfruit, bananas and coconuts as well as fields of flowers and grasses where cows and horses graze. The road up from Falmouth weaves by 200yearold stone fences past fields and orchards, cattle and horses, gradually leading back in time to an era of grace and gentility. This magical perch commands sweeping views of the Queen of Spain Valley, endless hills and the refreshing Martha Brae River that wanders through the thick untouched bamboo forests below. The entire panorama takes in 20,000 acres of softly rolling mountains whose velvet texture changes with the light hour by hour. 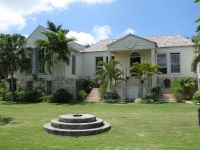 While extraordinarily private, Good Hope is less than an hour from the Montego Bay airport. Built in 1755 in classic Georgian style, the Great House was owned by the Tharpe and Tenison families in past centuries. Its current owners have lovingly updated the buildings while retaining many of its original features, including the first hot water bath in the Caribbean made in late 1700's and 14' tall Palladian windows trimmed with plantation shutters. Today, Good Hope is an exceptional home, privately nestled above tidy citrus groves and fields of coconut palm and sugar cane. Tables set with Spode China, rooms warmed by the patina of old mahogany, floors of smooth worn stone and honeytoned orangewood. It is intriguing to quietly imagine the scores of ancestors who walked these floors, dined in these rooms and discussed politics of the day for the past two centuries.